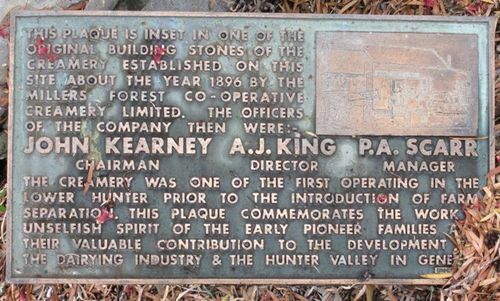 Plaque erected in 1971 commemorates pioneers and their contribution to the development of the dairying industry and the Hunter Valley. The plaque is inset into one of the building stones of the creamery which was established in 1890. The creamery was one of the first operating in the Lower Hunter prior to farm separation.